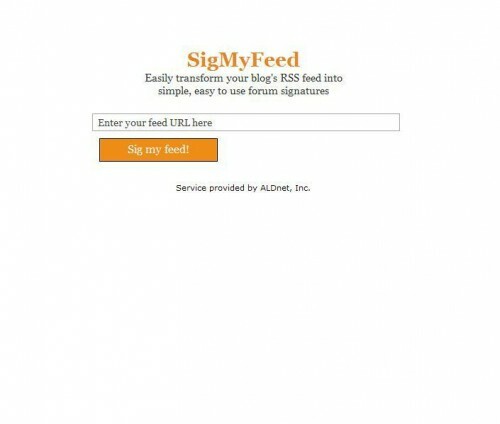 SigMyFeed.com is a cool new website that easily transforms your blog’s RSS feed into a simple and easy to integrate forum signature. Just enter your blog’s RSS feed and press the “Sig my Feed!” button. The one-page results provide four signature types with three integration formats (HTML, Forums, and direct Image Source). The cool thing is that the signature is constantly updated via RSS as you update your blog. On the down side, I’d like to see a few different color options available for the signatures. Overall, this signature tool is a great way to place attractive and updated signatures on forums. 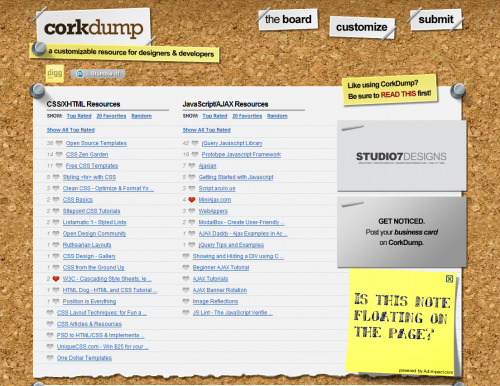 Corkdump.com is a customizable resource for designers and developers that I think is really cool! In an effort to be completely upfront, I will tell you that I recently purchased the site…but it is still cool! And since there is no revenue model, I think I am at liberty to share. Basically, visitors come to the site, check out the resources, then favorite them (by clicking the heart) if they like a particular resource. They can then come back to the site to find all of there favorite resources all on one page. The resources are then sorted by how many people favorited a particular one (highest rated ones first). Users can also customize how the categories appear on the page. You just click, drag and drop and then hit the “Save Category Order” button to save your settings instantly. Users can also submit (for review) websites that they like, or sites that they think others would like. It is nice that users do not have to register to get the full functionality out of the site as it is cookie based. The potential downside to that is if you loose your cookies. Ah…but technology to the rescue! After the first time you use the site, a new graphic will appear that says “Like using CorkDump?”. Just click on that link, and the system will email you a link that will fully restore your CorkDump cookies should you need it. So, check it out and leave me comments about what you think. Is it cool, or is it lame? In my opinion, there are no mobile phones in the market today that deserve to be labeled an “iPhone Killer”, or even a rival to Apple’s holy device. However, that doesn’t mean to say that I think the iPhone is the best phone on the market, there just isn’t much yet that is geared the same way. 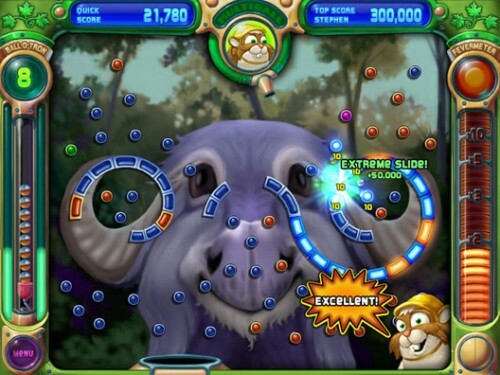 But there’s one device that is slated for release in the second half of 2008 that has really got me excited. 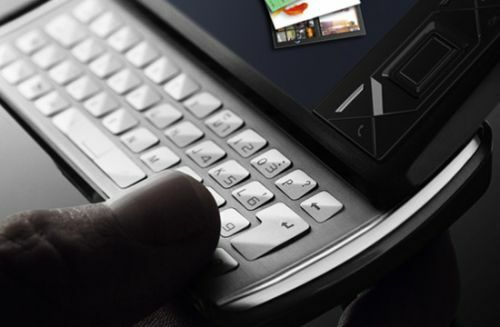 The Sony Ericsson XPERIA X1 looks absolutely gorgeous, with an amazing 800 x 480 pixel resolution, 3 inch screen (compared to 320 x 480 pixel for the iPhone), supporting basically every network standard and a featuring full QWERTY slide-out keypad (along with full touch-screen capability). 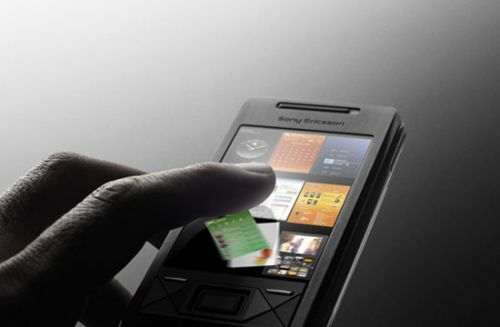 The software is based on Windows Mobile, but Sony Ericsson have put a huge focus on building the user interface, in an attempt to appeal to the iPhone generation. Coupled with full GPS functionality, Google Maps, WiFi, Video Calling, and a slew of other features, it really looks like the iPhone will have a worthy opponent later this year. If you’re as enthused as I am about the upcoming release of this device, then I suggest subscribing to inexperia to stay as up to date as possible with the latest developments.